Unit WW partially excavated in September 2018. Photo courtesy of Laura deBoer. 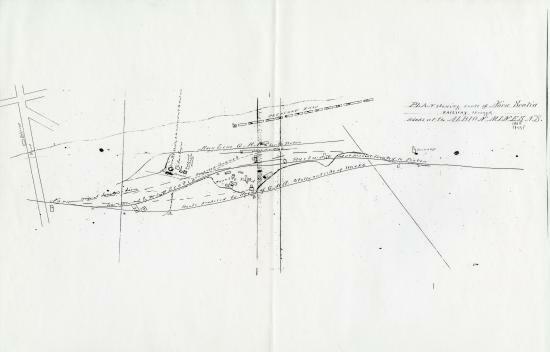 In 2018, with Industrial Heritage Nova Scotia, we continued our search for the buried ruins of the Albion Foundry on our site. If we found it, we hoped to learn how the technology and knowledge of the British Industrial Revolution was brought to Nova Scotia. 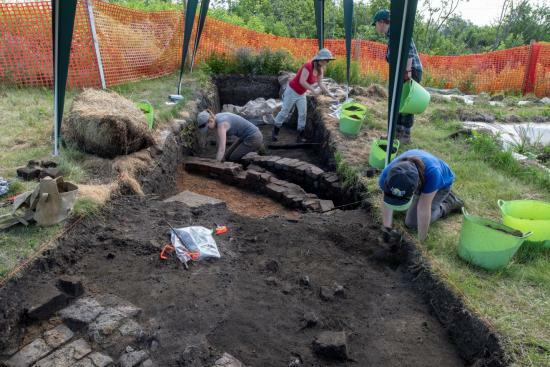 This will increase our understanding of the beginnings of the industrialization of Nova Scotia, a transformation that influenced the development of Canada. 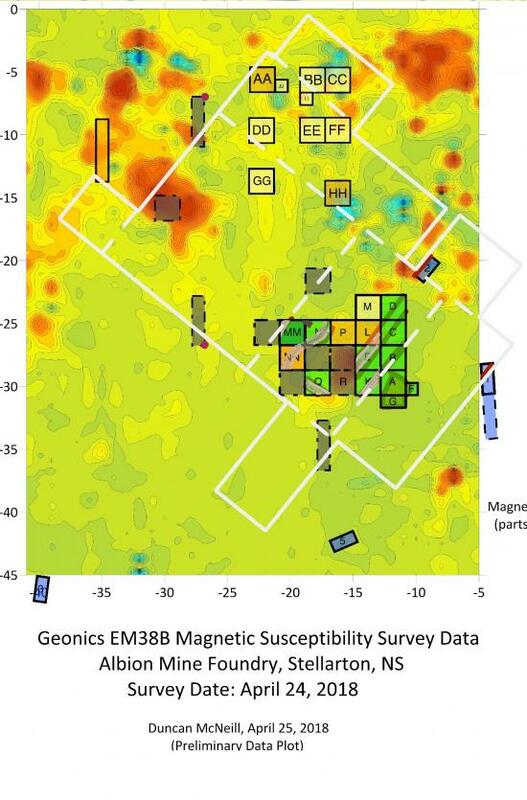 Laura, our lead archaeologist, created a predictive model showing the potential outline of our foundry building on top of the magnetic susceptibility survey data compiled by Duncan McNeill and overlain with the locations of past and present archaeological dig units. 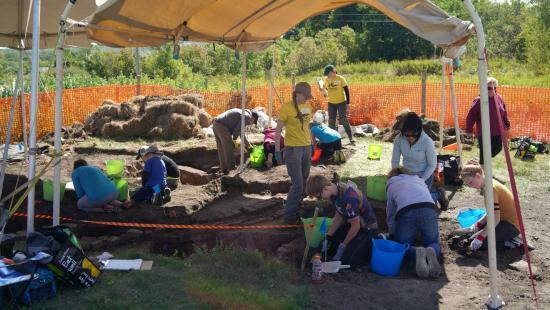 The 2018 season included a geophysical survey of the site, the construction of a predictive model of the building’s orientation, size, and layout, and the testing of that model during two professional digs and a weekend public dig. 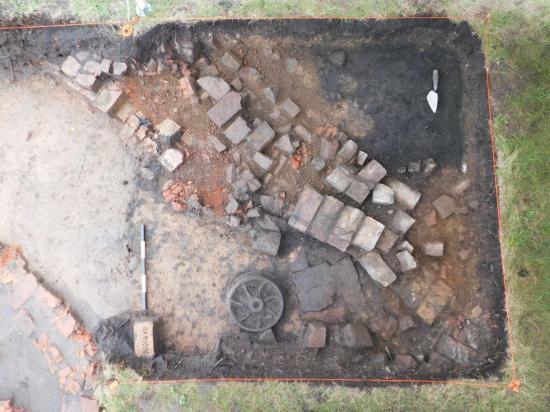 This sustained effort gave us significant progress in uncovering the ruins of the 1820s iron foundry on our site. Four new sections of brick walls were uncovered, which help us to refine and confirm our predictive model. The July dig started with the features discovered last year and expanding from there in search of an exterior wall of the foundry. If that was found, it could be followed to possibly reveal the outline of the entire building. Three professional archaeologists and a volunteer (yes, that is Michael, head of our Reception Services) uncovering more clues to our iron foundry. 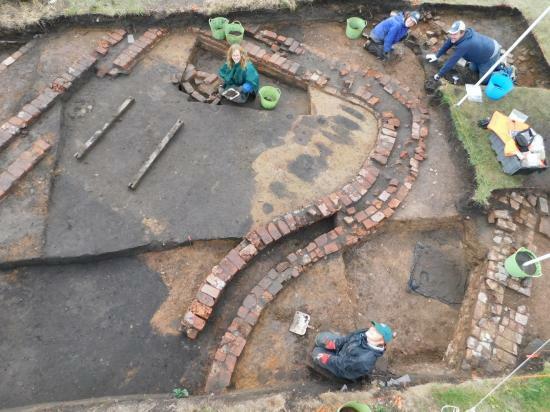 By the end of the dig season in September, we were able to confirm that we have found the foundry building! The edge of the casting area has been defined, another probable exterior wall and two interior walls have been identified. A packed earth working floor with a thin layer of coal trampled into it may represent an area for machinery. Also uncovered are the unique twists and turns of a vent or drain feature set into the foundry’s sand casting floor. It appears to have been turning to avoid objects such as the machine that must have been set on two parallel iron rails or feet set into the sand. The shape of the foundry complex is beginning to emerge.